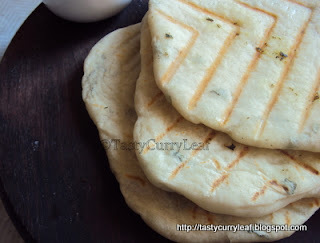 This is a simple flatbread recipe which is enhanced with basil.I am not that great fan of certain fresh herbs,but with basil I am floored.I love the aroma of fresh basil and wish I could grow some. (Ok I do not have a green thumb).Normally I use basil for making granitas and other pasta dishes and even soups and have frozen it as well following Kalyn's recipe whose link was sent to me by Aparna.But recently I found myself saddled with extra bunch of fresh basil once and I tried this excellent flatbread recipe from Epicurious.This incorporates basil in the breaddough and also uses basily olive oil to grill the flatbread and in general wonderful.I halved the recipe and went for medium size flatbreads and they were over as soon as they came off the grill. I served them with savoury grilled tomatoes and cottage cheese(paneer) and these were perfect. Blanch 1.5 packed cups of fresh basil in hot water for a minute.Dry it on paper towels and blend it in a mixer adding 3/4 cup of olive oil to get a smooth puree.Season with salt and pepper and dark green basil oil is ready. You can use the remining oil for making mashed potatoes or as a salad dressing or whatever way you like.This quantity gies you 3/4 cup of oil and you can adjust the total amount but make sure the ratio of the leaves to olive oil (2:1) remains the same.The blanching in water is supposed to prevent the oil from looking muddy or dirtyish. 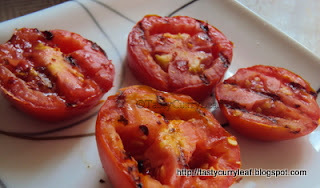 Slice the tomatoes into thick rounds.Season it with chilliflakes,salt and/or other choice of spices that go well with tomatoes.Let it sit for atleast 10 minutes while the grill is beaing heated up. When the grill is ready,spray little oil - veg or olive- on it and place the slices.Let it cook for 1-2 minutes after which turn it over and you can see nice grill marks on the slices.Keep aside and keep warm. I simply crumbled paneer with hands into a bowl.Season it as per choice -little or no salt works fine as the rest of the items are seasoned.If the tomatoes have left behind some juice,simply add little of that to paneer as well. In a bowl,mix together yeast,sugar and warm water and let it foam for atleat 10 minutes.To this add in 2/3 cup of flour and 1/3 cup room temperature water and mix well and let it rest covered for 20 minutes. Add in salt and olive oil to this mix and add the 1&1/2 cups of flour and remaining water to the oil-yeast mix alternately in 3 batches (1/2 cup apf each). This results in a very sticky dough /mass. Fold in thinly chiffonaded fresh basil and put the herbed sticky mass onto a floured surface and knead to form a smooth pliable dough adding more flour if needed.It took me 1-2 tbsp extra flour to get a pliable dough.Do add flour in tbsps till you get a smooth dough. Keep the dough in a oiled bowl,turning once to coat,covered in a warm area until it doubles in volume-atleast 45 minutes. Turn out the dough onto a floured surface gently punching it down. Divide into small pieces and shape each piece into a smooth ball.Place the dough balls in a greased baking sheet,covered and let them rest for 20 minutes or until doubled. Take out each ball and roll it out into a medium thick round.Prepare the grill -gas or electric. I used gas top grill.Brush the flatbread with basil oil and place the oiled side on the grill.Grill until the bottom turns golden brown.Brush the top with basil oil and turn to cook that side as well.You can see nice grill marks on it. 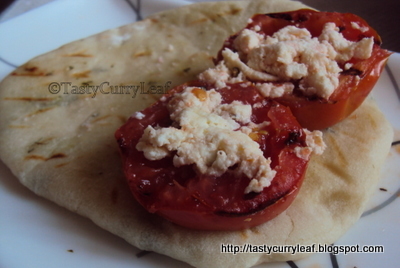 Serve it rolled up with Grilled tomatoes and crumbled paneer, topped with more basil oil as preferred. The texture of the bread is same as naan with the added freshness of basil. This is supposed to be the popular starter of a Kansas Restaurant.You can divide the bread into smaller pieces,top each piece with tomato slice and paneer and basil oil and serve as a hearty starter.You can also make the bread and tomatoes previously and at the time of serving,cut the bread into small triangles,top it with a tomato slice,and fresh grated mozzarella/cheddar/whatever you like and warm it in the microwave till the cheese starts to melt. Except for cheese,this is completely vegan.Hopefully Zorra will like it for WBD 2010. I'm quite excited by this bread. I have a lot of basil growing in my pots and keep looking for ways to use it up. 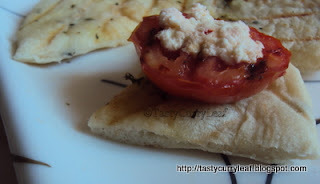 Grilled tomatoes with cottage cheese and basil flatbread sounds very delicious. Love the flat breads! Nice presentation. Beautiful looking flatbread, awesome looking grilled tomatoes..
Lovely bread Sweatha! I want to try growing parsley and other herbs given the difficulty in finding these at near by stores. Please accept an award I have shared with you..
What an interesting idea. I lovet he markings on the bread and am sure the flavour is great! Yumm! Of course, my dear, I like it! It looks and sounds delicious! Thank you for participating in World Bread Day.